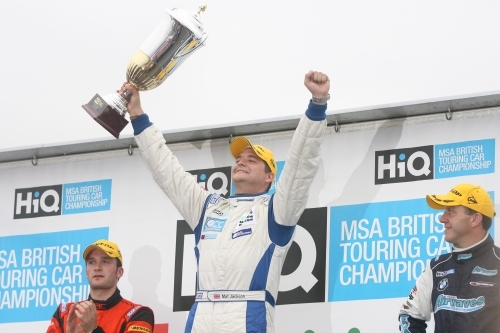 Mat Jackson took a double victory as the HiQ MSA British Touring Car Championship headed to Silverstone over the weekend with team-mate Jason Plato rounding off a great weekend for the RML team by taking the other. Race one saw Mat take the lead on lap three just before the safety car came out to allow the rescue teams to recover the BMW of the returning Anthony Reid, a BRDC Full Member, and BRDC Rising Star Tom Onslow-Cole. Green flag racing resumed on lap nine and Jason Plato was soon trying to make a move to take up third place. He succeeded on lap ten while Colin Turkington had moved into fifth. On lap 17 the safety car was deployed again as there was oil on the track and when green flag racing resumed there was just one lap left for a quick dash to the chequered flag. Mat Jackson took the victory ahead of Chevrolet team-mate Jason Plato with Colin Turkington in fourth in the Team RAC BMW. Colin’s team-mate Stephen Jelley was seventh just ahead of Superstar Jonny Adam who was ahead of Paul O’Neill, Matt Neal, Tom Chilton, Superstar Andrew Jordan and BTCC debutant Johnny Herbert who was 13th. In the second race it was Mat Jackson once again who took up the initial lead just ahead of Jason Plato with another BRDC Full Member, Colin Turkington, in third. Matt Neal took a trip to the gravel at Brooklands on lap four, but managed to keep his Vauxhall Vectra going and got going again following some assistance from the marshals, albeit at the back. On lap eight it was time for a change at the front as Jason Plato got the better of his RML team-mate. On lap 11 Matt Neal was back in the gravel trap at Brooklands but once again managed to keep his foot in enough to come out again while up front Colin Turkington had lost a place and was now fourth just as the heavens opened. Mat Jackson lost his second place as he ran wide at Luffield on lap 18 but managed to hang on to third for his second podium finish of the day with Jason Plato going on to win. Colin Turkington finished fourth just ahead of Tom Chilton, who was followed to the chequered flag by Superstar pair Andrew Jordan and Jonny Adam. Jonny Herbert, in only his second BTCC race finished in eighth, while Paul O’Neill was tenth. Stephen Jelley finished the race in 12th just ahead of Rising Star Tom Onslow-Cole with Anthony Reid, who he had been battling with throughout the race, just behind him in 14th. Race three saw Superstar Jonny Adam as the highest placed BRDC competitor at the start in second place just ahead of Colin Turkington, Mat Jackson and Johnny Herbert. Superstar Andrew Jordan and BRDC Full Member Tom Chilton both spun at Brooklands, leaving damage to both their Vauxhall Vectra and Ford Focus ST’s respectively. Although Andrew was able to stay out, Tom was forced to retire on the following lap. It was Johnny Herbert’s turn to head for the gravel on lap three at Luffield but he was able to rejoin at the back of the field. By lap four Mat Jackson was up to second just ahead of Colin and Jonny Adam while Johnny Herbert was forced to retire on lap nine. Lap 12 saw Mat Jackson head into the lead and despite several attempts from Rob Collard to deny him a second victory, the Chevrolet driver held on for the win. Colin Turkington took the final podium spot just ahead of team-mate Stephen Jelley while Superstar Jonny Adam and Jason Plato finished in sixth and seventh respectively. Paul O’Neill was ninth in the Sunshine.co.uk Honda Integra while Anthony Reid, Matt Neal, Rising Star Tom Onslow-Cole and Superstar Andrew Jordan made up places 12 to 15. Tim Harvey has put an eight point gap between himself and BRDC Rising Star Tim Bridgman at the top of the table for the Porsche Carrera Cup GB following the two races at Silverstone over the weekend. Tim Bridgman finished second just ahead of BRDC Full Member Tim Harvey in the first race on Saturday afternoon with Michael Caine just off the podium in fourth.